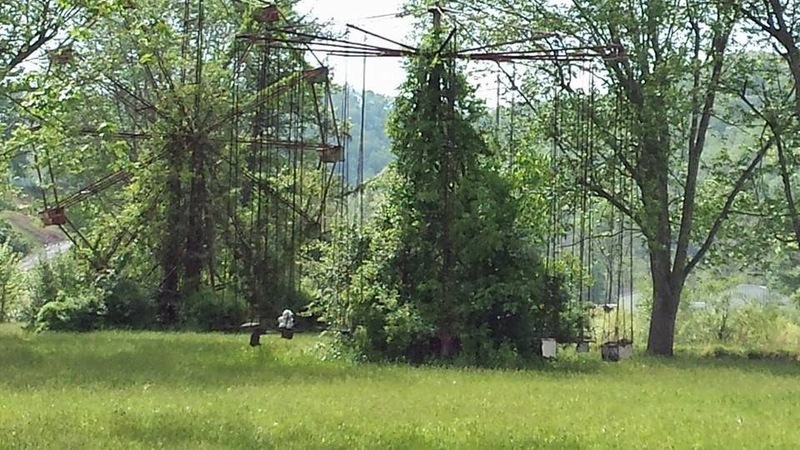 The Lake Shawnee Amusement Park gained notoriety after being featured on a 2005 episode of Scariest Places on Earth. The amusement park opened in 1926 by C.T. Snidow, who ran the park until its closing in1966. The site of the park is located atop of the Mitchell Clay family massacre, which occurred around 1781. There are several different stories as to what happened that fateful day, but we do know that two of the Clay children, Tabitha and Bartley, were killed by a local Indian tribe. Today, a memorial for the massacre stands on the park property. In 1985, a man by the name of Gaylord White bought the property, and reopened the park. White had worked at the park as a young man in the 1950s. Unfortunately, due to insurance concerns, the park was closed three years later, and now only operates as a fishing lake and campground. In 1988, a team of archaeologists from Marshall University excavated the area, and found evidence of two different Native American settlements. They uncovered several tools, artifacts, and at least two bodies, those of an infant and an adult male. Aside from the Clay massacre, there have been several deaths associated with the park. When the park first opened, the property contained a saloon, complete with prostitution, illegal gambling, and a speak-easy. A man was allegedly murdered over a large sum of money. In the 1950s, a little girl is said to have died on the swing ride when a soft drink truck accidentally parked too close to the ride, causing her to slam into the side of it. Mr. White has personally witnessed the apparition of this little girl, who he describes as wearing a pink dress with ruffled sleeves. 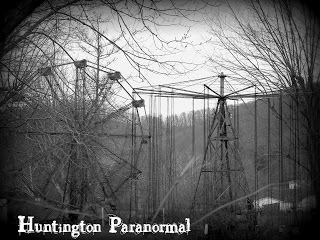 People also say that you can witness a cold spot and see orbs floating above the swing seats. Unfortunately, another excellent group that researched this location talked to locals and law enforcement personnel, and could not verify this story. The third death was that of a little boy who drowned in the lake. The lake has now been largely drained for "mud bogging," and what remains is a small pond that hosts catfish tournaments every Saturday night. A later witness once claimed that she almost drowned in the lake as well. She said she was swimming, and it felt as if something was trying to pull her under and hold her down. Another possible death is from a man falling from the Ferris Wheel. While this may or may not be just legend, people have reported seeing a man in the seat located at the 9 o' clock position. The apparitions of Indians have also been seen, especially in the area of the former concession stand. Karen Stuebing--Visit for more photographs and information! Keep up to date on this location on Theresa's Haunted History FaceBook! You're welcome! I saw a need for a site like this, and I've tried to fill it, lol. I can't always ensure that my research is infallible, but I've tried my hardest to double check facts, give the best info out there, and not lose sight of the folklore. Thank you for visiting! Great site.Just wanted to point out in your first paragraph, you refer to the massacre as a "faithful day". Perhaps you meant "fateful"? "Faithful" implies some satisfaction or justification for the killings. I believe "fateful" was the word you were looking for. In any regard, great info. Thanks! Thanks for the correction! I admittedly tend to write these late at night, and then fail to proofread, lol. It's been changed...and thanks for visiting! Great site and great information! Thank you! This site is at the junction of State Route 10 and US Route 19, in Mercer County. We are in the southern part of West Virginia. Do you know what the dates are for the annual haunted tours? Appalachee Paranormal is doing a wonderful program each Saturday in October, I believe. Here's a link to their FB where you can get more information. That definitely sounds like quite the interesting urban legend! I don't foresee any personal trips to that area of the country anytime soon, so if anyone in the area visits, please send me pictures! I grew up close to the lake and my mom would take me to hear my cousins play music on most weekends. The adults knew there had been deaths there, they told the kids that there were Paranas in the lake so we would not try to go swimming in it. Personally I remember feeling like I was being pushed on the slide and on the swing, but I loved going there. Thanks for sharing your experiences! I think I've heard other people remembering their parents telling them similar things about the lake to keep them away from it. Thank you for your additional information and insights! Wow! In all our reading, we had NEVER heard of the Clay attack in Pearisburg. Have you ever tried to contact the group Clay Memorial Park Foundation with this information?? Or, the Mercer County Historical Society? In all the writings of others - NONE of this has been documented! As a child I lived in one of the cabins on the lake. My Dad worked for Mr. Snidow and among other things, he was in charge of running the big swing on the lake. I can remember riding the swings, swimming in the pool and just having a great time every time I went there. I loved that place and I have a lot of fond memories of it. Wonderful! Thank you for sharing your positive memories about this location! I heard the place is fenced in, but with the fishing, etc., couldn't I get in if I went to the amusement park to look around?? I wouldn't recommend trespassing on this property. There is a number on the fence to call for access. I love all of the info for this site...I never knew it was even around until I came across a link for it on Facebook. I really like this page and all of the history I have learned about this site. Very cool. I live in Louisville, Ky so as far as I know all we have is the Waverly Hills Sanitarium. Thank you! I'll definitely do a little searching and add a Louisville location to my Kentucky page real soon! Does anyone have the number from the fence? Thanks! We have been trying to call and no answer yet. You're welcome! Keep in mind that this is Gaylord's busiest season as there are TONS of people trying to contact him for access to this location right now. Sorry; I don't have an "official" address, but its located along route US 19 (Beckley Rd.) and WV 10. It's about five minutes outside of Princeton, between Princeton and Spanishburg. I'm almost positive that's the price that was quoted to our case manager when she inquired about an investigation. Thanks for sharing that info! the guy told me the same thing I wanted to metal detect on the sight he told me no. I was told there was a million+ in gold and silver on the property. but I was told 150 up to ten people as well. That's interesting about the gold and silver! I hadn't heard that, but I definitely wouldn't be surprised if there were that much in scrap metal laying around, lol. A radio station up in DC was talking about this place this morning and now I can't stop reading up on it - thanks for all of this detail. DC 101's "Elliot in the Morning" brought up the story. May be talikg a road trip. Not a big believer in ghosts, but open to see someone else be spooked. You're welcome! Thanks for stopping by. It's a pleasure to see that our little slice of WV spookiness is so well known. You can, but you have to have permission from the owner. Up in the comments there is a phone number listed. How do I contact the owner to set up a private investigation? I'm very interested!! I am a direct descendent of the Clays. Their daughter, Rebecca was my fifth great grandmother. Thank you for the interesting information!!! You're welcome, and thank you for visiting Theresa's Haunted History and sharing your interesting lineage with us!